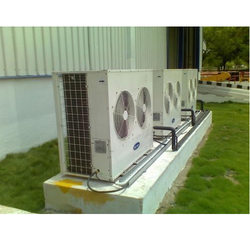 Prominent & Leading Exporter from Chennai, we offer commercial air conditioner, sun green temperature control system, industrial air conditioner, sungreen negative pressure system and process conditioning systems services. Is your Commercial Air Conditioning process condition providing the best in terms of quantity and quality? Is your equipment functioning at it optimal best? Productivity can be immensely improved by providing an atmosphere where the equipment and process work under the conditions that give maximum results. For example a process dealing with paper can depend on moisture levels, solvent evaporation and corresponding threshold limit; food processing industries also require precise humidity and temperature control and freshness of air. We look into your production line and optimize results with respect to humidity, temperature and pollution control. Contact us immediately and see your productivity multiply with economical process conditioning measures. 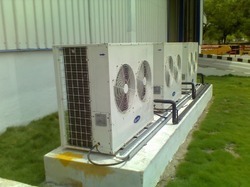 Unmatchable quality of SunGreen Temperature Control System is offered by us to customers in bulk. 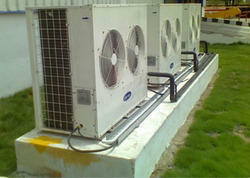 The offered SunGreen Temperature Control System is extensively used in various suitable applications. Further, our SunGreen Temperature Control Systems are highly durable in nature. Turbo cool is our revolutionary air conditioning system that utilizes sustainable technology to provide you cool conditions economically and without using harmful or costly refrigerants. 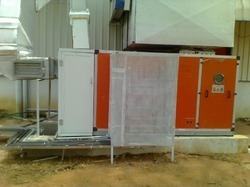 It is a 100% fresh air system. It is also custom designed to suit your requirements. Industrial Air Conditioner, it contains the Muti-cycle lateral Dry Fog AHU Unit, which is the only one of its kind in the world. Turbo Cool is a muti-cycle dry fog evaporation cooling system, which uses fraction of energy of normal air conditioning systems. Depending various conditions including the geographical location of the building, Turbo Cool can totally substitute normal air conditioning systems. No more dry, recycled and stale air in your building. A combination of techniques are used to achieve the optimized solution including displacement ventilation, zoning techniques, maintaining air flow patterns etc and a variety of products including our wind driven roof ventilators/turbine ventilators –Turbo vent to provide customized results. Our systems are flexible enough to provide precise temperature and humidity at a particular spot or zone. Our systems are also flexible enough to incorporate refrigerants for cooling, if your requirements specify the same. Turbo Cool Systems are ideal for spot cooling, zone cooling, industrial cooling applications and is proven for its efficiency. We are a leading Exporter of SunGreen Negative Pressure System, operation theatre air condition, cleanroom solutions, pharmaceutical cleanroom, sterile room and cleanroom hvac design services. Process Conditioning Systems Services: Is your process condition providing the best in terms of quantity and quality? Is your equipment functioning at it optimal best? 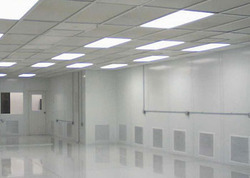 Productivity can be immensely improved by providing an atmosphere where the equipment and process work under the conditions that give maximum results for example a process dealing with paper can depend on moisture levels, solvent evaporation and corresponding threshold limit, food processing industries also require precise humidity and temperature control and freshness of air. We look into your production line and optimize results with respect to humidity, temperature and pollution control. Contact us immediately and see your productivity multiply with economical process conditioning measures.